Hypodermic needles are designed to smoothly penetrate the skin with minimal damage. However, the sharp point of the tip is very easily deformed, even with careful handling. Scanning Electron Microscopy (SEM) is able to show how the tip is hooked after removing it from the packaging. Using this needle would create additional tissue damage, especially on withdrawal. The needle was examined again after being put through a leaf. Energy-Dispersive X-Ray spectroscopy (EDX) shows patches of organic and inorganic contamination. 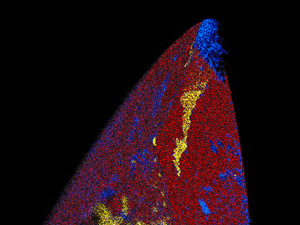 In this false-colour map, red represents the iron from the stainless steel needle itself, blue represents carbon, and yellow represents silicon. EDX allows us to chemically distinguish between different types of contamination which is not possible by eye alone.